For those able to listen to BBC Radio 3, Frieda Hughes, the daughter of Sylvia Plath and Ted Hughes, will be the guest of Michael Berkeley's Private Passions, Sunday 28 February 2010 at noon. Thanks to Gail Crowther for bring this to our attention. Happy Saint Botolph's Review Day! Ladies, make sure you bite someone on the cheek today! 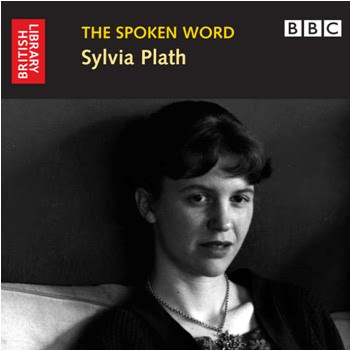 Look for a new CD, The Spoken Word: Sylvia Plath, published by the British Library, on 14 April 2010. Advanced orders will be accepted via the British Library's website in mid-March. Readers of this blog will be eligible for a 10% discount; look for an update here about that, also in mid-March. "Sylvia Plath is widely regarded as one of the most influential poets and authors of the 20th Century. Her frank, confessional style of writing won her many fans around the world, and she remains very popular over forty years after her death. This new CD from British Library Publishing brings together BBC recordings from the British Library Sound Archive, and includes Plath discussing and reading from her work. A particular highlight is a 1961 recording of a BBC programme Plath recorded with her husband, Ted Hughes, where they talk about their marriage and what it means to live with your muse. Many of these recordings are being published here for the first time." The previously unpublished recordings include the interview Two of a Kind: Poets in Partnership, surviving extracts from A World of Sound: What Made You Stay?, a review of Donald Hall's Contemporary American Poetry, and the poem "Tulips" recorded live at the Poetry at the Mermaid Festival in London on 17 July 1961, and more. This is an amazing collection of audio tracks, one that will continue to lend vigor to the study of Sylvia Plath. This is the first Plath audio release in more than three decades with new, previously unreleased recordings!! Laurel Green of the Australian Stage recently reviewed Sylvia Plath: The Girl Who Wanted to be God, a stage production "using Plath's poems, diaries, and letters to her mother" written by Karen Corbett, Rosemary Johns, and Brenda Palmer. The review was posted on the 19th, and the performances ended on the 20th. Doesn't make much sense to me either. This work seems contrived from other dramatic adaptations, written in the 1970s, by Barry Kyle and Rose Leiman Goldemburg. I'd love to read the script to be able to judge for myself, but as Laurel Green concludes her review, thing kind of interpretation "merely reminded me [Green] to return to the page, as Plath's words are the closest we can get to her self." This isn't the first time around the block for the production. Here is a link to a review in 2002 written by Helen Thomson of The Age. Sylvia Plath wrote "The Bed Book" in the spring of 1959. By June of that year she was actively marketing it; but in her lifetime it never came to be printed. In 1976, both Faber and Harper & Row brought out editions in the UK, illustrated by Quentin Blake and in the US, with illustrations by Emily Arnold McCully. While not included in any bibliography to date, excerpts of "The Bed Book" were printed in two American periodicals in 1976. In October 1976, Woman's Day published it. Though excerpted, there are some textual variations, mostly to do with stanza structure, capitalization, etc. This publications includes beautiful color illustrations by Sal Murdocca. It appears on pages 98-99. The two covers of these periodicals appear here. They, and others, can also be found on the thumbnail gallery page of my website for Sylvia Plath. The Nation published Plath's poem "Temper of Time" in their 6 August, 1955. Did you know...This has the distinction of being the first and only known publication by 'Silvia Plath'. Well, the table of contents lists it as such, under the poem on page 119 her name is spelled correctly. This was Plath's first publication with The Nation. She went on to see "Frog Autumn" (January 24, 1959), "Departure" (March 7, 1959), and "Two Views of a Cadaver Room" (January 30, 1960) also published there. Grace Schulman's recent First loves and other adventures is now available from University of Michigan Press series Poets on poetry. In Schulman's book is the chapter "Plath and Yaddo". This title was published on January 15, 2010. University of Michigan Press also brought us the incomparable The Unraveling Archive: Essays on Sylvia Plath edited by Anita Helle. Plath's library on LibraryThing is slowly growing. It is now exceeds 500 books. The Helm Fellowship to Indiana University is massively responsible for this growth. I have dozens of pages of titles left to add, so please bear with me. I'll add further posts at random milestones. On second notice, it appears that Schulman's "Plath and Yaddo" is reprinted. 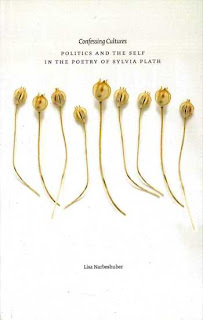 It appeared also in Paul Alexander's Ariel Ascending: Writings about Sylvia Plath (1985). So, not the new publication I was hoping it would be. In the current issue of Hotel Amerika (Columbia College, Chicago) poet Amy Newman has two poems of interest to Sylvia Plath and Ted Hughes readers. The poems appear on pages 102-103. Her poems "The Hanging Man/The Tender Place" and "Fever/Fever 103" both borrow lines from Plath and Hughes' poems. The structure of each poem is line(s) of Plath, line(s) of Hughes, line(s) of Newman. She enters into the conversation in a very clever, original way. It is certainly one of the more successful examples in this genre where Plath (and Hughes) become the subject of the poem. For more on Newman, see her website. At the time of writing, Hotel Amerika's website was down and no other referral information could be found. The American Museum of Natural History in New York City is hosting a launch party for Bright Wings: An Illustrated Anthology of Poems about Birds on Wednesday, March 10, 6:30 pm, at the Kaufmann Theater, first floor - Enter at 77th Street. Ticket prices are $15 adults, $13.50 Members, students, seniors. The anthology features "Pheasant" by Sylvia Plath. Illustrations were done by David Allen Sibley. Shelia Griffin Llanas' Contemporary American Poetry-"Not the End, But the Beginning" features a chapter on Plath. This is published by Enslow Publishers. Unrelated - does anyone out there have the text of the poem "Sonnet: To a Dissembling Spring" handy? Copies exist at the collection at Indiana and within the Edward Butscher papers at Smith. Building on other analyses of Plath and politics (Tracy Brain and Robin Peel), in Confessing Cultures, Narbeshuber takes complete control of the subject at hand and has written a sound, solid work. She is at her best in Chapter 2, which is a close reading of "In Plaster." While not an obscure Plath poem, this kind of treatment I think is not the norm. She also examines the more canonical poems by Plath including "Lady Lazarus", "Daddy," and the bee sequence, and in doing so further supports her thesis and opens new avenues into each. This is a short book - but do not let this trick you. Lisa Narbeshuber has written succinctly and there is neither a wasted word nor an excess. The economy with which she has executed this critique mirrors, perhaps intentionally, those poems of Plath's she examines and her view of their inspiration, cohesion, and construction. As far as the book itself, it is wonderfully designed - the cover of dried poppy seed pods ("Where are your opiates, your nauseous capsules?") is lovely. There is a colophon, which is nice to see; but no index, which was sorely missed. No theory or critical approach can encompass the whole of Plath's works (nor should it! ); therefore promoting one methodology over another necessarily removes from the field of inspection a large chunk of Plath's output. Narbeshuber carefully looks at a handful of poems, but the genius of her study is that the work she does discuss is done so expertly. Critics (and/or academics) really fear biographically reading Plath's poems. Susan van Dyne, Tracy Brain, and Marsha Byrant and many others seem to want to avoid it at all costs. However, each has needed the biography at some point in their own valuable contributions to Plath studies: it is simply unavoidable. But no matter what, if you look at Plath's poems using approaches such as psychoanalysis, feminist, historical, environmental or another, the biography comes into play. It is important. It does matter. And in doing so one is not necessarily supporting either that Plath should be read biographically or her inclusion as a Confessional Poet (which as Narbeshuber has argued rightly is a bad assignation). This little digression, by the way, is not meant as anything negative about Confessing Cultures. While Narbeshuber seems to agree that "focusing too exclusively on Plath's life" can be limiting in the attempt to decipher her work; her own work - just like all books of criticism - is limiting because it does not (cannot) apply to everything Plath wrote. (xi) This is clearly one of those "Why can't we all just get along" moments! The more we examine Plath's works in an historical context, the more reliant we are on the accuracy of her biography as a means to assess.